I tend to look for short movies to watch on weeknights, as I often can't start a film until wrapping up work fairly late in the evening. I'm frequently impressed by the effective storytelling in movies with compact running times. 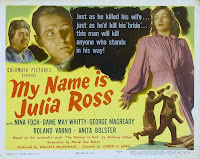 Last night's 61-minute film, WOMAN AGAINST WOMAN (1938), and tonight's movie, the 65-minute thriller MY NAME IS JULIA ROSS, are both great examples of highly entertaining films which don't run much more than an hour. MY NAME IS JULIA ROSS was directed by Joseph H. Lewis and was originally intended as a Columbia "B" film for the second half of a double bill. It was shot on a low budget in just 10 days. However, according to TCM's Robert Osborne, the movie was so well received by preview audiences that it was promoted to the "A" list. The film's opening credits appear against the classic establishing shot of London's Big Ben and Parliament Bridge, after which the audience meets Julia Ross (Nina Foch) on the proverbial dark and stormy day. Julia, an American in London, is behind on her rent and having trouble finding a new job. Fate seems to be kind to Julia when she visits an employment agency and lands a live-in post as a secretary to a kindly old lady, Mrs. Hughes (Dame May Whitty). Julia moves into Mrs. Hughes' London home later that evening, but when Julia wakes up...two days later!...she's locked in a room in a creepy old house overlooking the cliffs of Cornwall, and everyone calls her "Marian." Marian, it seems, is -- or was -- the wife of Mrs. Hughes' son Ralph (George Macready), a Mama's Boy with anger management issues, to put it mildly. No one will listen to Julia when she exclaims "My name is Julia Ross!" Everyone from the servants to the villagers believe "Marian" is "ill." Julia can't find a way to escape, and she becomes increasingly desperate as she suspects the Hugheses plan to kill her. Nina Foch admirably carries almost the entire movie, believably playing Julia's confusion, desperation, and terror. She's onscreen for a majority of the running time. This is the first film in which I've seen her as a leading lady, and I enjoyed her performance very much. Dame Way Whitty also contributes an excellent performance, switching between the sweet butter-wouldn't-melt-in-her-mouth old lady which is her public persona, and the hard-edged murderous dame in private. Mrs. Hughes is willing to do anything to keep her dear son Ralph out of trouble, even if it involves kidnapping and murder. The Hughes family members, it seems, are the ones who are actually crazy. The supporting cast includes Roland Varno, Queenie Leonard, Doris Lloyd, and Anita Bolster. The cinematography was by Burnett Guffey, whose films included ALL THE KING'S MEN (1949), IN A LONELY PLACE (1950), and FROM HERE TO ETERNITY (1953), for which he won the Oscar. Robert Osborne pointed out in his Turner Classic Movies introduction that much of the film is shot in tight closeups, as that prevented the need for building extensive sets! The close-ups also contribute to the film's claustrophobic feel. The movie used a minimal number of sets; the most lavish setting of the film is the exterior of the Cornish mansion. It would be fun to know where that was shot. The film was based on the novel THE WOMAN IN RED by Anthony Gilbert. Earlier this year Suzidoll wrote an interesting essay on the film at the TCM Movie Morlocks blog. (Those who don't wish to read more extensive plot spoilers may want to save it for after they've seen the movie.) The film has been shown on TCM. Update: This film is now available on DVD in the Columbia Pictures Film Noir Classics III Collection from the TCM Vault. 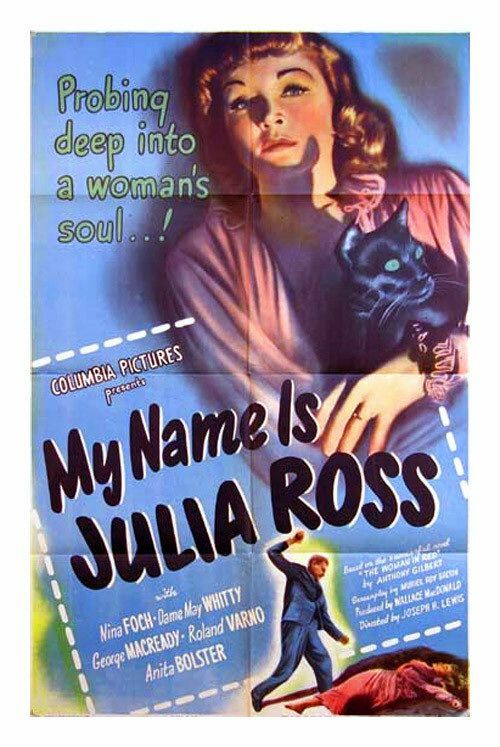 February 2019 Update: MY NAME IS JULIA ROSS is being released on Blu-ray by Arrow Academy. Extras include a commentary track by Alan K. Rode of the Film Noir Foundation. My review of the Blu-ray is here. That's just my kind of movie. I've already set up a reminder at TCM for July 14. Hope you'll enjoy it! It felt a little bit like a TWILIGHT ZONE or ALFRED HITCHCOCK PRESENTS meshed with "gothic noir." It's a fun hour.